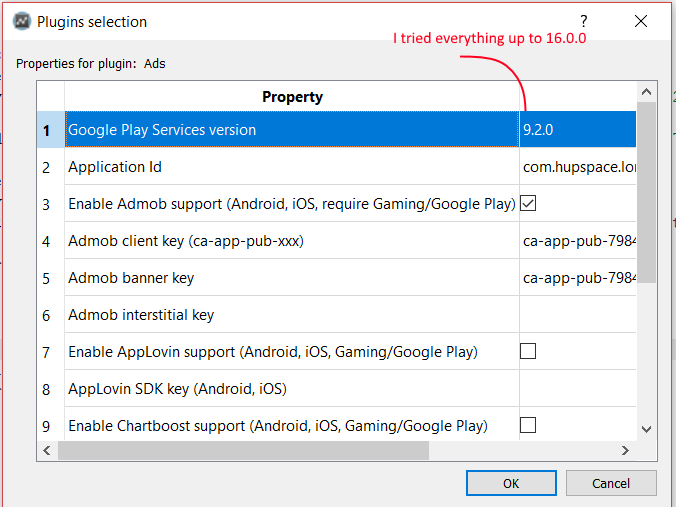 > Could not find com.google.android.gms:play-services-ads:9.2.0. > Could not find com.google.android.gms:play-services:9.2.0. Seems like I have the same problem. Maybe I take the wrong approach when setting up the google services version? What steps exactly am I supposed to take in order to change the version of the google services? 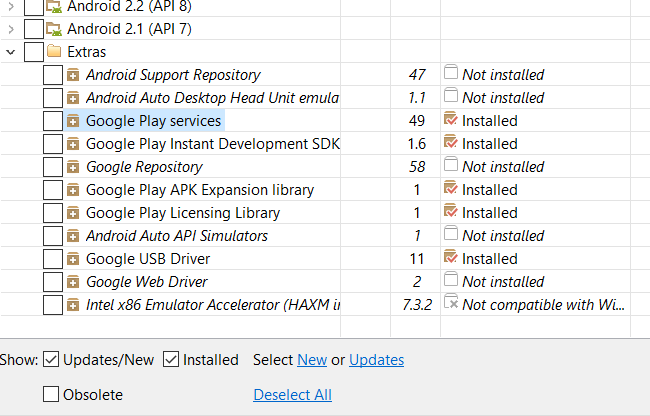 Go to the ads plugin's properties and you will see a setting for the google play services version to use. I did, I changed it and still I get the same error. 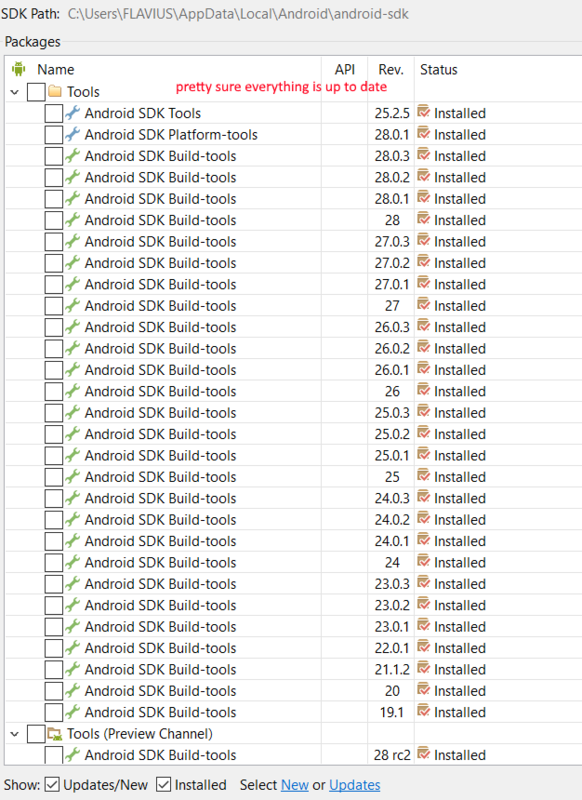 Have you run Android Studio, and made sure you have the latest SDK and tools installed? Ok so I took some screenshots. I'm pretty confused about this whole thing and I hope these can help someone explain me what is going on, because I swear I've tried everything. Now I understand that there might be something obvious. Again, this is my first time dealing with admob. (Also it should be worth mentioning that the app works fine on the phone via the gideros player. I even tried it with the example ads and they were displayed. Same error at exporting though). On top of that, I have the app up on google play's internal testing server, so I am certain the problem is not tied with my app or the google services side. So yeah, pretty confused about this whole thing. I appreciate anyone trying to help. I'll try to export it via Android Studio from scratch, see if I manage to pull it off. New update on the situation: things are worse than I thought. After about 8 hours of spelunking in the depths of stackoverflow I may have found the problem. Essentially, there is not just one problem. There's something wrong with everything from the gradle up to the ad class itself. I messed A LOT with the android studio code and ran from an error to another almost endlessly. The problem is that I am still confused about what is going on. It seems that there is more than just one problem here which makes it difficult to pin point one particular issue and fix it, because another one always pops up. @misterhup You need to set box 7,8,... to empty strings in the export. That way it will use the latest libs from Android Studio. The libs you are pointing to may be too old. Just have the gaming plugin, not the google play services plugin. That may sound obvious, but are you using latest gideros (2018.10). 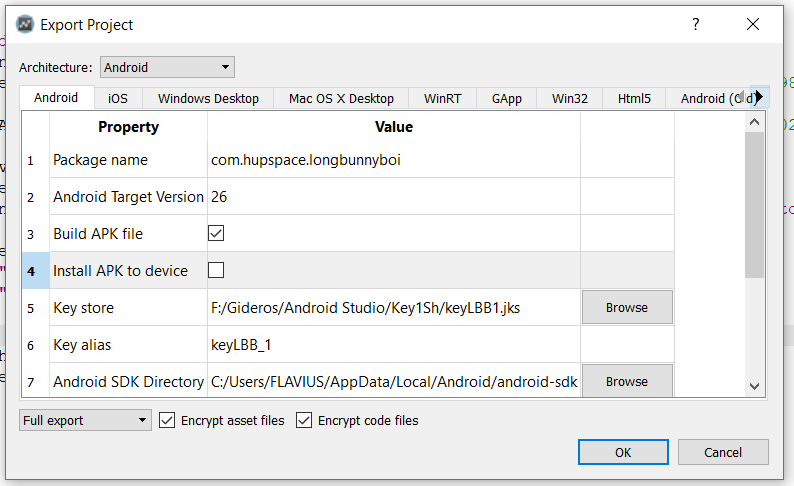 Are you using android studio 3.2 ? Ok so I got it to work!! Updated Gideros to the latest version, but kept getting the same errors except the gradle one which got fixed because of that (pretty obvious looking back now). Then I removed the google play services but retained the gaming one as Sinister pointed out and everything worked like a charm. Thanks a lot for the help and patience! 'Google Play Services' plugin is deprecated, probably it should be removed from the Gideros repo to avoid such confusions. I looked up App Id and that's what I ended up with. If that is not it, where can I find it? And does it matter if the app is published just internally? @misterhup To find the ID..
Now near the top, underneath the game title.. you will see the App ID. Personally I think that it should crash with the wrong ID because in theory that's important and is required for the plugin to function correctly. So yes, I found the ID, configured my stuff there, used the correct ID this time, exported the game to the internal channel, yet the moment I open my app, it closes. 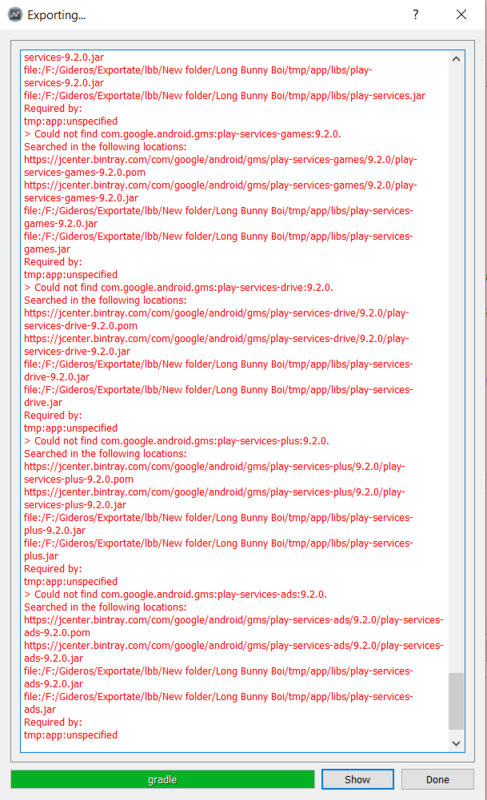 If the problem is indeed the Google Play Services Plugin, what do you think I should do? And also, thank you a lot for help, I'm actually starting to understand what is going on here. @misterhup I don't use Google Play Services anymore, it has been depreciated. I just use AdMob, iab, and Gaming plugins which covers all googley type things. I recently upgraded both of my Descent games using 2018.10 and they both work fine.. I'm using only small banner ads in one of them though. @misterhup - use 16.0.0 and the gaming plugin - not the play services plugin. @misterhup plugin 'Gaming' has all the functionality that was in deprecated 'Google Play Services' plugin, plus more.